Harvey and Frank Kinder, both Sun City residents in Indian Land, are ambassadors through the USA Pickleball Association. They’re hosting clinics at the Fort Mill gym 1-3 p.m. each Wednesday in January, and open play 1-3 p.m. Tuesdays and Thursdays. 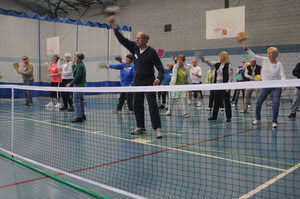 They’ve also taught the game at Indian Land Middle School, and worked with counties and homebuilders to find opportunities for new pickleball courts or, as is increasingly more common, repurposed tennis courts converted for the game.